we have for years started all special days with cinnabons. they used to be soooo much better than they are now. trust me. now you have to pay extra for the fresh rolls – and the not-so-fresh are way overpriced as far as i’m concerned. but when they were good, we’d pick them up the night before a birthday, christmas, any holiday, really. and they were breakfast. those days are officially over. bill and i have tried over and over again to perfect a perfect cinnamon roll. denied. too many times to count. wtf? it’s NOT brain surgery. we would not give up. last night we decided to try yet again. and this time we were going to try the easy route. 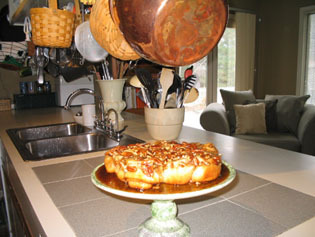 bill looked in our bread maker cook book and followed the recipe for sticky buns dough. by 9 a.m., we had a batch of sweet dough. ready to roll out and finish up. the cookbook hd a nice “sauce” recipe that i prepared while bill was rolling out the dough, spreading with butter, and sprinkling with a mixture of brown sugar and cinnamon. we rarely follow recipes exactly. they came out great. here’s a picture. and here’s how we’ll make them NEXT time. as you can see from the picture, there was TOO MUCH SAUCE. and. i want bigger, fatter buns. so i’ll make the bigger batch of dough. and i’ll leave off the pecans. just for the next time. follow your breadmaker instructions to create the dough – do not bake! roll out the dough (on a floured surface) to about 20” x 8”. spread the butter onto the dough. sprinkle the brown sugar/cinnamon mixture evenly on top. roll up the dough, rolling the short side across. cut the roll into 8 even pieces. heat the ingredients in a sauce pan until the butter melts and sugar dissolves. pour the syrup into an 8 inch cake pan. place the cinnamon rolls in the cake pan on top of the syrup. one right in the middle. the other 7 evenly spaced round the pan. place a towel over the pan and let the buns rise for an hour until doubled in size. bake the rolls in a 375 degree oven for 20-25 minutes. let cool only a couple minutes. invert onto plate, letting the plate set on top for a couple minutes. if i wanted cinnabon-like rolls, i’d leave out the sauce and frost the rolls with a cream cheese frosting. Thank you - I love cinnamon buns - and will try this when winter comes and it is pouring with rain outside and it is all cozy and warm inside. leave off the pecans(that's pronounced pah-khans)?!?! that's gastronomic heresy!! if you're going to go against common wisdom, at least try to use toasted pecans. they have to be toasted to bring out the sweetness. I don't cook but I want to hang out in your kitchen - it looks stunning and I know that some gooooooooood food has come out of it. Yummy! But, I am in Mike's corner on this one...puh kahns are the best, especially toasted! I havent had homemade cinnimon rolls since I was a little girl. Mom used to make them while we were at Sunday School so when we got home we had fresh hot rolls with PEE-CANS on them.